I was in Florence for a couple of days last week to see the two big art shows they have on at the moment — the Bronzino exhibition at the Palazzo Strozzi and the Caravaggio and Carravaggeschi show, which covers three venues (Uffizi, Palazzo Pitti and the Villa Bardini) and closes next Sunday. I’ll write more about the magnificent exhibition at the Strozzi presently, but just wanted to say a few words about the ‘Caravaggio’ show. I knew it wasn’t going to include much work by the master himself — the blockbuster exhibition in Rome earlier this year pretty much ruled that out — and was actually thrilled about its focus on the astonishingly pervasive influence he asserted all over Europe, during his lifetime and especially after his death. The problem, really, was that when you introduce an exhibition with the nine masterpieces by Caravaggio held in Florentine collections, and then follow them up with imitators, you have to work hard not to engender diminishing returns. 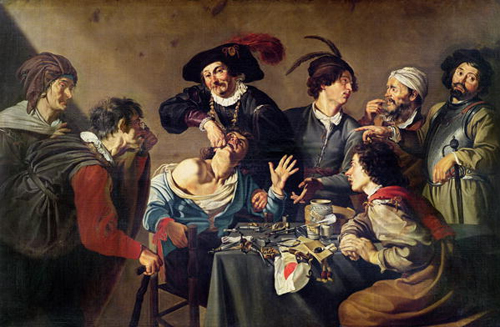 I mean, to see at first Caravaggio’s starkly compelling examination of human empathy and detachment in the Toothpuller and then to encounter its literalised, anecdotal flattening by Theodor Rombouts is just sad. In short, it was rather depressing to navigate this multitude of galleries containing mostly uninspired, superficial work by knockoff artists, who mostly just didn’t get what Caravaggio was about. But what made it worse was that no one had made much attempt to situate this work in context, much less explain it as a phenomenon. Why was this thought to be interesting? If the curators had an idea, they didn’t seem willing to share it. 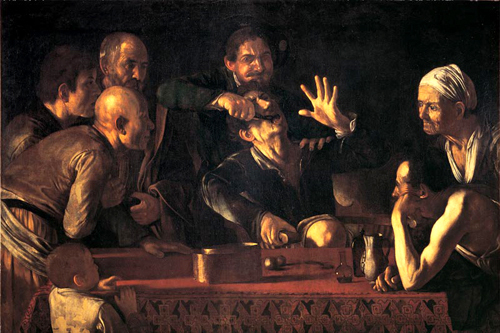 And to see the Longhi foundation’s broad, rather summary copy of the National Gallery masterpiece of a Boy Bitten by a Lizard still being passed off as the real thing was not encouraging (comparison here). The exhibition is basically a rehang, or if you want to be charitable, a re-presentation of the city’s deep collections of this stuff — the pictures you usually ignore on your long way out of the Uffizi on the second floor. Very little had been brought in from the outside. Which I guess is fine, but hardly occasion for so much hype (I should add that the catalogue, which I couldn’t afford, seems substantial and serious and contains new research). The one big, new discovery was a strong picture of Sts. Peter and Paul attributed to a young Jusepe de Ribera, the great Spanish painter (1591-1662), who would later go on to develop a powerful chiaroscuro from Caravaggio’s example. It was hard to reconcile with the later, clearly autograph pictures in the same room, but they were also almost two decades apart in date, so I guess they might be by the same hand. I unfortunately don’t have an image, but it is a substantial, weighty painting worth chasing up for comparison with known pictures by the master. Also, a hang of graphically efficacious, individual oversize half-length portraits of saints by him at the Bardini was impressive, though I found them hard to reconcile their slick brushwork and heavy outlining with the the more crumbly approach seen in the other paintings. But what do I know? I’m not a specialist. 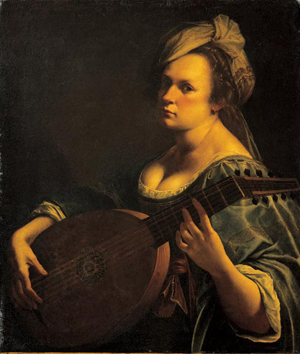 Anyway, Ribera, with his dry, scruffily realist approach, his bleached-out bodies and oppressing shadows was in any case one of the few highlights, the other — predictably — being Artemisza Gentileschi (1593-1656), who may not be such a virtuoso, but who unfailingly puts so much of herself on the line that her work becomes compelling. The self-portrayals as Salome, the Magdalen and Judith are awesomely strange statements of a both pugnacious and vulnerable personality. And then, at the very end of the Uzzifi leg of the show, there was a small display of drawings by Andrea Commodi (1560-1648), not included in the exhibition catalogue. They were absolutely fascinating. Mostly portraits, including a few self-portraits, and figure studies, some of nudes, they had a slight naïvité about them, and a busy, almost stipply approach to hatching, which gave them a modernist air, like something drawn in Vienna at the dawn of the 20th century. They had an incredible immediacy — the female nudes rivalled Schiele and Kokoschka for their intimacy, and the portraits had a mask-like, primitivist quality that wouldn’t have been out of place in Paris at the same time (here’s a drawing that wasn’t in the exhibition; though rather good, it doesn’t really convey what I’m talking about unfortunately). Anyway, the Bronzino alone was totally worth the trip; more on that soon.